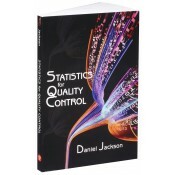 Industrial Statistics for Quality Control is a basic level study of statistics used in a production operations setting. It is primarily intended for students entering quality control or other industrial and operations careers. It covers introductory topics such as a brief background, measurements, and graphing techniques. It then moves on to the beginning statistics necessary to understand these practices commonly found in industry and ends with coverage of quality assurance issues along with some pertinent managerial practices associated with this topic. Industrial Statistics for Quality Control is designed for trade schools, corporate training programs, technical and community colleges, or freshman level university students beginning a major in quality and quality management. It could also be used as a refresher for more advanced students or students in other operations topics not focused entirely on quality. Industrial Statistics for Quality Control is also intended for students entering an industrial career in a production or manufacturing setting; or are already employed and require training. The statistics found in this text is “non-calculus” or “non-engineering” statistics, yet includes the most common practices found in an industrial setting regarding quality control statistics. Includes many easy to understand industrial examples of skills needed on the job. Includes Basic Inferential statistics for hypothesis testing on the job. Minitab & Excel data sets are used in many of the examples and home work problems. Uses informal language to explain key concepts and processes used in Industry. Daniel Jackson is an Associate Professor of Architectural and Manufacturing Sciences at Western Kentucky University. He has more than 30 years of teaching and research experience in manufacturing operations and design, quality assurance and control, six sigma, lean concepts, and graduate courses. He works extensively with students by teaching, advising, and directing their career interests. He has traveled throughout the world teaching and conducting research.